* Prima® White gold is now offered with Superior grade A interlocked taklon and seamless golden plated brass ferrules, which are attached to perfectly balanced handles with the highest grade of waterproof epoxy available. 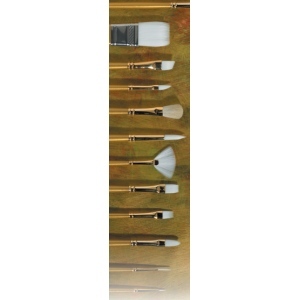 * The enhanced shape retention and the excellent spring of the superior taklon makes this artist brush a pleasure to use in even the thickest of mediums. * Prima® White Gold has a rich elegant look to match its superior materials and construction. * Martin/F. Weber Co. is offering this high quality artist brush at suggested retail prices that one would normally associate with student grade brushes.